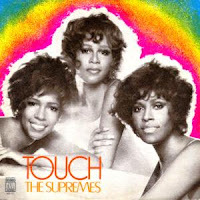 From the 1971 album Touch comes "Nathan Jones," one of my favorite Supremes songs. The subject starts out as a downer (girlfriend's been dumped, boyfriend's been gone too long), but the tune is upbeat because time has healed any wounds. She's changed the locks and "there's no room in my heart for you no more." It's not exactly "I Will Survive," but shares that later hit's theme. This might be the most democratic of all Supremes songs: all three members sing lead - at the same time, no less - and all three sing "oohs." Production is by Frank Wilson, who also produced "Stoned Love." The Funk Brothers' instrumentation manages to sound both '70s-fresh and '60s-variety-show classic. It went to 16 on the pop charts. The group was still actively recording and releasing records for Motown during the period of The Cusp of Everything (1975-76), although they were to disband in 1977. "Nathan Jones" is one of Mark's lessons in Karen's Supremes indoctrination in Chapter 9.